Want to give your child a sibling? Study says a dog may be better! As wonderful as siblings can be, growing up alongside them can mean we often feel claustrophobic. So it’s no surprise when the sibling rivalries start. With the hindsight of adulthood, I’ve realised that in my family I often felt like the cheese in a cheese grater. Though there was a lot of laughter and love, there would be times where living in each other’s pockets meant we’d grate against each other constantly and perpetuate that classic love-hate relationship siblings tend to have. And in those times, when everyone was fighting and no one seemed to understand me, I went out and hugged my silky-coated Australian terrier. There’s something about pets, isn’t there? They are so unconditional in their love and so limited in their expectations of us. They’re grateful for the pats, hugs and attention we bestow on them. They’re happy for a simple bowl of pet food and a quick run in the park. And the tail-wagging exuberance when we get home after a long day is a far cry from the grunt of greeting (usually directed at a screen) that we get from our nearest and dearest. We could swear that in our furry friend’s big, warm eyes are all the traits of wisdom, sensitivity and understanding that our family can sometimes be so deficient in. Pets just get us. It’s no surprise then that a recent (and very cute!) small study found that young adolescents have a much stronger bond with their pets than with their brothers and sisters. The study interviewed 77 12-year-olds, and results showed that children reported more satisfaction and less conflict with their pets than with their siblings. Interestingly girls were more likely to have a close relationship with a pet than boys, and dog owners reported more satisfaction and closeness than owners of other pets. The study is limited, though, as it only focuses on 12-year-olds (and what hormone-driven pre-teen doesn’t find their siblings pretty annoying?! ), so we’d be interested to hear from kids of all ages and owners of all kinds of pets. What do you think? 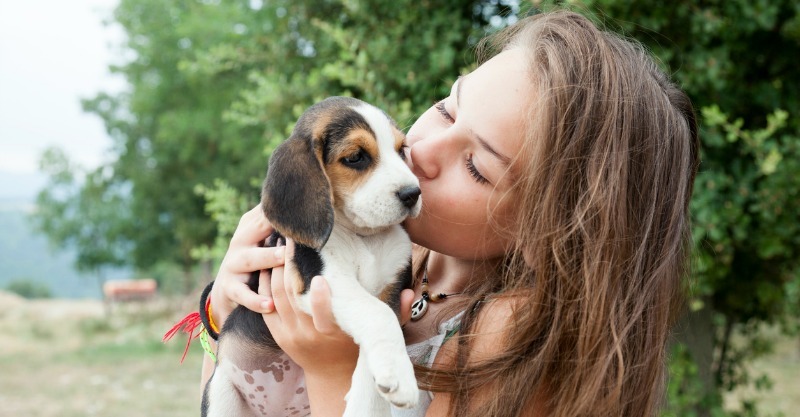 Does your child have a closer relationship with their dog? Or another pet perhaps?